Detective Chief Inspector David Henderson joined Retail NI Chief Executive Glynn Roberts in making his appeal in the wake of the seventh ATM theft this year, which happened in Ahoghill in the early hours of this morning. There have been seven ATM attacks this year including the removal of two ATM machines during one of the ATM attacks on February 1 at a business premises at the Ballymena Road, Antrim. “Once again the public and business community have today learned of another ATM theft; of another business targeted by these brazen thieves who have struck at the heart of a rural community. 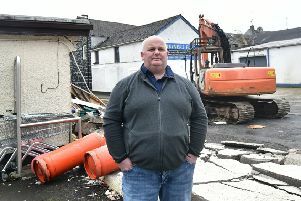 “As in all of these ATM thefts, the actions of these criminals have not only caused immediate financial harm to the business that was targeted, but they have understandably caused fear in the community and impacted upon a vital service many local people rely on. "There’s also the loss of very expensive machinery, which cause delays in production, damage to the local economy and the likelihood of criminal finances being redirected back into funding further organised crime or terrorism. “The reckless actions of these criminals are despicable and I want to assure the public our dedicated team of detectives working across Northern Ireland specifically focussing on this crime is actively working with the banking industry and retailers. “We are doing all we can to catch the people responsible – it is a key priority for us. “The key to stopping these crimes and getting ahead of these criminals is information from the public. “We need people to report anything suspicious, including seeing any unusual activity or people in areas close to ATMs. For example, if you hear machinery late at night or in the early hours please let us know. 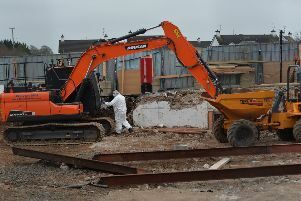 Detective Chief Inspector Henderson added: “I would also encourage those either using or storing heavy plant machinery such as diggers or telehandlers on sites, or facilities near commercial premises to ensure that these machines are kept locked, secured and immobilised to prevent theft. “Please, if you know anything about any of these thefts, or if you see any suspicious in your area pick up the phone and call us on the non emergency number 101. “Also, if you see people or vehicles appearing to pay particular attention to certain premises, call police on 101. In an emergency or if you suspect a crime is in progress, dial 999."